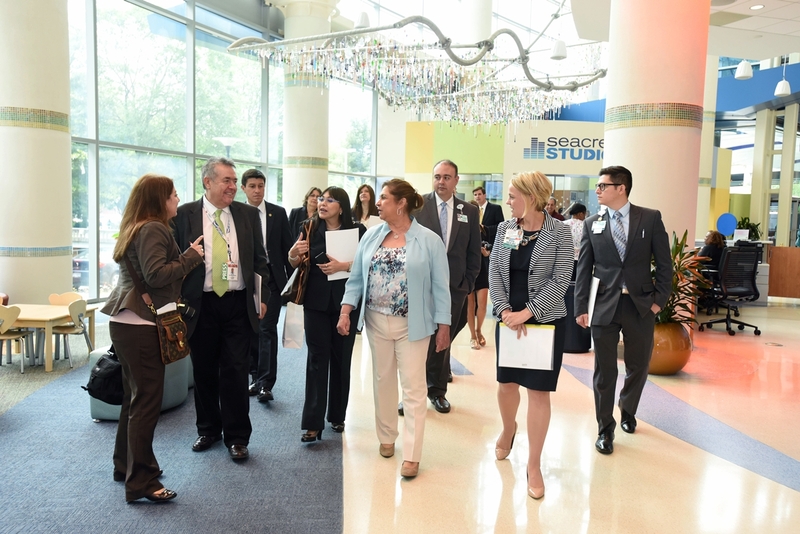 The First Lady of Guatemala, Rosa Leal de Pérez, visited Carolinas HealthCare System’s Carolinas Medical Center as part of a two-day trip to Charlotte this week, touring the hospital’s specialty services, including the region’s only Level 1 trauma unit, Levine Cancer Institute’s bone marrow transplant unit and Levine Children’s Hospital. Leal de Pérez also recognized the System’s International Medical Outreach (IMO) program for its ongoing support to develop sustainable healthcare in Guatemala through medical equipment donations and education. “I am grateful to the program for its support and am here to say thank you on behalf of the thousands of Guatemalans who have benefited from your contributions,” Leal de Pérez said. Over the past two years, the IMO program – a collaboration with the Heineman Foundation of Charlotte – has worked with the First Lady’s foundation, Secretaría de Obras Sociales de la Esposa del Presidente (SOSEP), to provide quality healthcare equipment and services to Guatemalan hospitals and clinics in need. Pictured Above: Since 2013, Carolinas HealthCare System’s International Medical Outreach program has worked First Lady of Guatemala Rosa Leal de Pérez's (center, wearing blue jacket) foundation to provide quality healthcare equipment and services to Guatemalan hospitals and clinics in need. 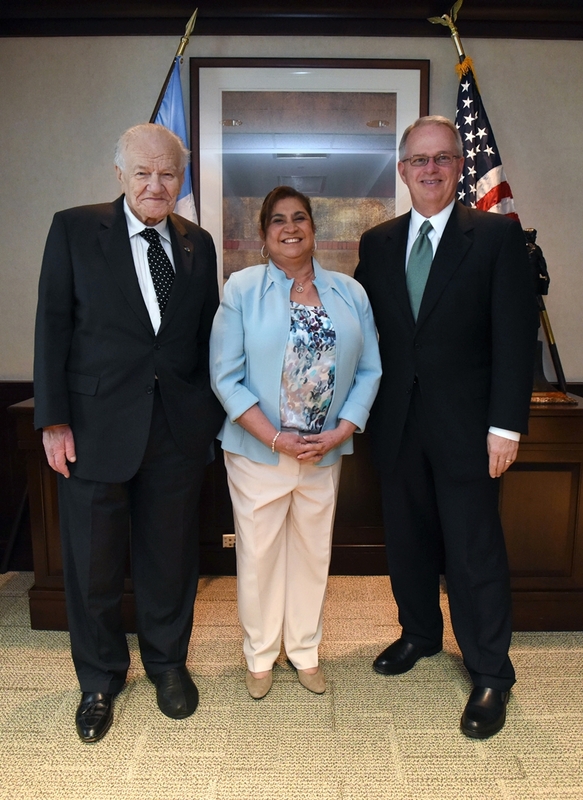 “It is a privilege to welcome and introduce the First Lady to Carolinas HealthCare System and to be an integral part of efforts designed to deliver much needed medical resources in Guatemala,” said Michael C. Tarwater, chief executive officer for the System. Leal de Pérez was involved in the IMO program’s recent donations of infant beds, warmers, monitors and other equipment to a neonatal intensive care unit in Guatemala’s Hospital Regional de Cobán. Since the equipment installation in January, infant mortality in the unit has decreased by half. In December 2014, the First Lady joined Carolinas HealthCare System officials for the opening of an echocardiography (echo) laboratory in Hospital Regional de Zacapa. Echo machines are used to diagnose heart problems in children and adults. Pictured Above: Francis Robicsek, MD, PhD, vice president of the International Medical Outreach program (left) and Carolinas HealthCare System CEO Michael C. Tarwater welcomed the First Lady of Guatemala to Carolinas HealthCare System. “The network of echo labs bring cardiac diagnosis into the modern age for millions and facilitate the delivery of cardiac services at low or no cost,” said Francis Robicsek, MD, PhD, vice president of the IMO program. In Guatemala, eight rural hospitals now have these labs and have provided more than 12,300 echocardiograms to thousands of patients.